For every language exists a seperate content tree. So it is possible to have a different site architecture in every language. The content tree is independent: An operation (for example deleting a page) in a language's content tree will not affect the content tree of any other language. There is only one content tree for all languages. The nodes (\Cx\Core\ContentManager\Model\Entity\Node) determines the site structure. So the site structure is in every language the same. 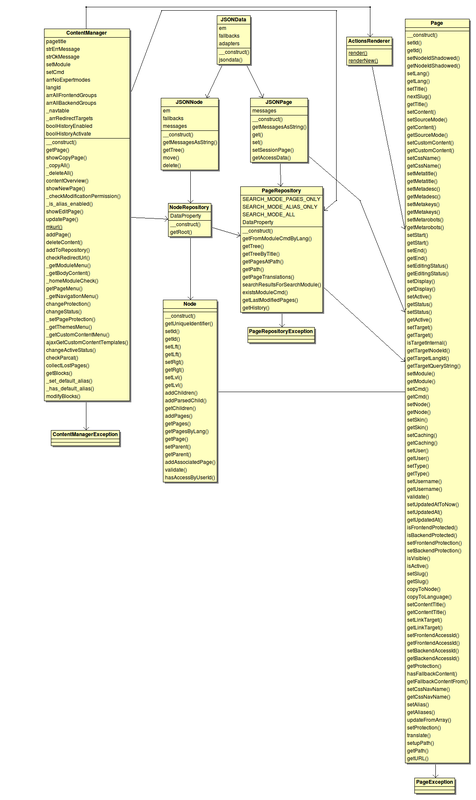 Every node has pages assigned (one page for every language). The content of the pages are stored in page objects (\Cx\Core\ContentManager\Model\Entity\Page). The root node is a special case: It has no content pages, it's just the invisible root of the node tree. ALIAS An alias for a page or website This is a special case. Alias pages are not shown in Content Manager (more information at Find an alias). URLs are built by traversing the node tree from the root down to the desired page. For all parent nodes we visit, the slug of the assigned page in the same language as the target page is appended to the url. Every page stores it's slug name. The slug is automatically set when first giving the page a title. Normally it's better to store the Node-URL placeholder instead of an URL and parse it when generating the output, since the placeholder is more flexible! 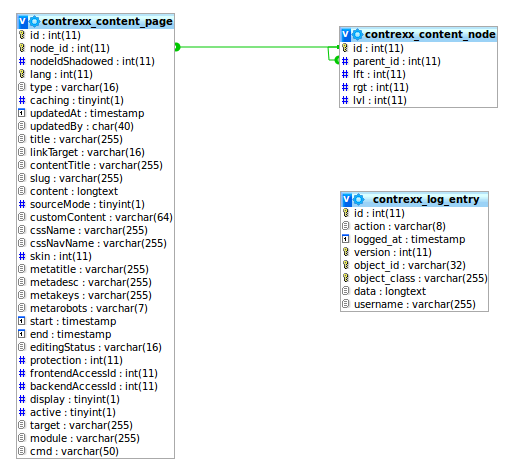 Contrexx 3.1 includes the \Cx\Core\Routing\NodePlaceholder class. This class allows conversion from and to placeholder format. See the API documentation for further details. Use the LinkGenerator to parse the node-URL placeholders. For Contrexx 3.1+: Please note, that the namespace for page and node has changed to \Cx\Core\ContentManager\Model\Entity. For previous releases of Version 3 use \Cx\Model\ContentManager instead. Aliases have the language id 0 which is not assigned to the active languages. For this reason you can't find them by passing the criteria "'lang' => 0". But you have the possibility to pass the boolean "true" as second parameter of "findOneBy()" which causes that the page repository also searches in the inactive languages. Every page with a language L must have all of it's parent pages available in translation to language L. If that is not the case, the page is lost and invisible. Remember how URLs are built - we can't build an URL for a page where we do not find the slugs in language L for the parent pages. In the Contrexx content manger is the page the owning side and the node the inverse side. This page was last edited on 9 September 2014, at 05:34.